BlackBerry phenomenon is strong enough inherent in society. Even High end segment dominated Nokia now begin to compete less by BlackBerry handset. To further widen wing, the BlackBerry series that combines the business and multimedia, the BlackBerry Storm 9500. BlackBerry Storm 9500 variants can be spelled out in the new BlackBerry portfolio. The rather innovative design and that is the same as the BlackBerry QWERTY is so viscous and changes in the interface using the touch screen cause pro and contra. You have small hands will be busy to access the menu on the top of the default view range. However, the presence of the ability to auto rotate the screen landscape mode, easier for users to use two hands to access the menu. The loss in the front panel keypad, not without reason. Here, innovation is a new BlackBerry that is applied to most new products. For typing and other access, BlackBerry Storm 9500 to set up a virtual keyboard. Unlike the full QWERTY keyboard that is used sail touch other smartphone, BlackBerry Storm 9500 property using new technology, known as "SurePress". Through this technology, the process of typing still feel the withdrawal pressing conventional keypad. Screen is not only untouched, but it really should be. This mechanism facilitated the spring under the screen. Unfortunately, that make you not use the "SurePress" This certainly feels busy. Moreover, the display is there in the BlackBerry 9500 Storm does not feel rock solid, or due to a special pedal that is used. Compared with the Bold and Javelin, BlackBerry Storm 9500 has been using the new operating system version, namely 4.7. Automatic, look and menu structure is also different smartphone. The menu icons appear larger than the Bold and Javelin property. But a matter of strength and clarity screen, BlackBerry Storm 9500 property remain the same with the Bold, Curve and the Javelin, with no upgrade performance. Only a technology that changed the model to the touch screen. Model flashjuga no animation in the interface BlackBerry Storm 9500, The form of static images with classic folders. 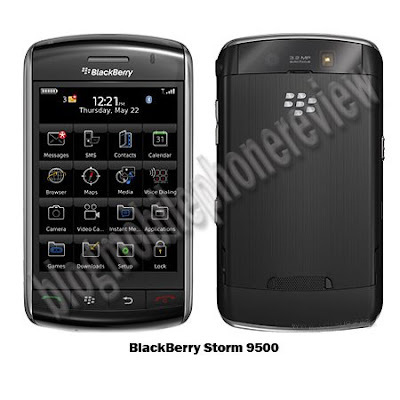 If compared with other technologies such as Touch TouchWiz UI, Apple's portable OSX and Nokia S60 5th edition, owned BlackBerry Storm 9500 is still less attractive. Interface changes surely have an effect on the performance of hardware and software inside. For that, use the BlackBerry Storm 9500 processor with 624 MHz clock speed. more powerful than the Javelin, but if compared with the Bold just a little different. Unfortunately, the flash memory on the BlackBerry Storm 9500 is only 128 MB. Result, the level of acceleration performance and the system so slow. Alternative to storage, BlackBerry Storm 9500 to prepare the memory card slot MicroSD manifold. Hinga capacity of 16 GB. Like previous series BlackBerry, BlackBerry Internet Service or BlackBerry Enterprise Server service to become the most dominant. Almost all countries, this service integrates with the mobile operator. Through the services offered, users can access email in real time, without having to enter the database webmail first. Not only for access to email, this facility can also connect you with the features that are now hot. As the access portal facebook, chatting to upload images to use (Gtalk, Yahoo Messenger, AOL, Windows Live, ICQ and the BlackBerry Messenger). The process of setting and the login to each service is also easy, important service BIS / SSX has been activated. Features for navigation, using the BlackBerry 9500 Storm path Assisted-GPS that is, through the cellular network operator. Meanwhile, for its own digital map, is available BlackBerry Maps. But you also still can add a digital map software of third parties such as Google Maps. For performance, A-GPS on the BlackBerry Storm 9500 can be used as a navigation guide traveling. Navigation routes and estimation of the time also can be displayed properly. Can be in text format and route map. For office work, this smartphone is very useful also sustain business activity. Features that support them in any Office To Go (Word, Sheet, slideshow), MemoPad, Task and Note that Voice can be sent directly via email or instant messenger. During the process of writing tasks and notes, BlackBerry Storm 9500 also made it easier to copy / paste data. In the entertainment sector, BlackBerry Storm 9500 to compete with Nokia XpressMusic tight. Have camera, music player / video and gaming. For the camera, smartphone has a 3.2 megapixel camera resolution plus the ability to autofocus and flash. Matter of interface and features supporting others, property BlackBerry Storm 9500 is the same as the property of Javelin. Default position of the image such as a digital camera similar. Unfortunately the position of the camera lens and flash lights in the back corner of the body feels less fit. Because, while the left finger images sometimes cover the lens and flash. In addition, the camera's response to determine the focus point automatically be calculated still slow. In fact, to move an object caught will difficult. Luckily, a little to improve this add smartphone features image stabilizer. To record video, with the ability Javelin and Bold. The image resolution can be adjusted for various purposes. Good for email / MMS or video player in accordance brought BlackBerry Storm 9500. Saraba other entertainment is also not less important is the media player. Here, you can choose to display photos, video, ringtone, record sound or play music. It looks simple, with the same interface with the Javelin and Blod. But a matter of capability, this player is not less than the media player Sony Ericcson Walkman phone. There are also port female jack 3.5 mm. Unfortunately, for the alternative entertainment, this smartphone will only provide some of the fruit game without Fm radio. Unlike the Bold and Javelin, Storm BlacBerry only rely on media such as Bluetooth connectivity and a data cable without microSD WiFi. This is a shortfall. Given that, you do not subscribe to the BIS / SSX can only rely on the service line GPRS/3G only for browsing the Internet. Can not access through a free WiFi Hotspot. For Internet browser, BlackBerry Storm 9500 on home-made browser that supports wap and web format. BlackBerry Storm 9500 using Lithium Ion battery as power source. Capacity is the same as the standard Javelin, which is 1400 mAh. With additional features that 3G is enabled continuously, automatic battery endurance so extravagant compared with the Javelin. Normal, can only standby for 1 day. From the seniornya, BlackBerry Storm 9500 can be spelled out most products made revolusioaner BlackBerry. Touchscreen presence, with the technology "SurePress" able to bring a new sensation lovers mobile phone business as well as multimedia. As well as a touch screen with pembeda owned iPhone 3G and pocketpc. There is a 3G network and A-GPS so plus point. However, its exclusive service BIS / SSX BlackBerry sometimes making enough. Moreover, it must be a PIN, and subscribe to the service operator. If not, you can only use the BlackBerry for a phone and sms only.